7:01 a.m.- Officers responded to a report of a possible burglary in the 1100 block of Willard Street. 10:40 a.m.- Officers responded to a reported domestic dispute in the 100 block of Schell Avenue. 2:45 p.m.- Officers delivered a jail release notification in the 400 block of Charlotte Street. 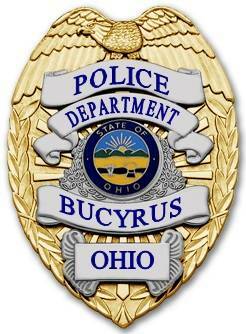 3:22 p.m.- A Bucyrus resident came to the police department to report an attempted check scam. 3:27 p.m.- An employee at Speedway reported her vehicle damaged while parked at the business this afternoon. 4:09 p.m.- A report of an unlicensed driver in the 400 block of North Sandusky Avenue was received. Officers could not locate the vehicle before it left town. 4:48 p.m.- A report of a child left alone in a vehicle at Kroger was investigated. 4:50 p.m.- A resident in the 900 block of Elm Street reported receiving threats from someone she knows. 5:54 p.m.- A county resident came to the police department to report a domestic disturbance from a few days ago on Hopley Avenue. 7:25 p.m.- A disturbance at Speedway resulted in a customer being trespassed from the business. 10:34 p.m.- A report of suspicious people in the area of Earl and Milo Streets was investigated. 11:31 p.m.- Jesse Singer, 35, was arrested for possession of drug abuse instruments. He was issued a criminal summons and released with a pending court appearance. 11:43 p.m.- A Franklin Court resident reported her 17-year-old son missing. Officers located him and returned him to his mother.